1. A magnetic field, commonly called a field, whose function it is to furnish magnetic lines. In the earlier machines this consisted of a two-pole magnet but the modern generators and motors are provided with four or more poles. The reason for this is that a more compact machine can be produced. A generator whose field consists of a two-pole magnet is called a bipolar generator, while one with a magnet consisting of four or more poles is called a multi-polar generator. 2. An armature which is made up of insulated windings of copper wire on an iron core. The function of the armature is to cut the magnetic lines of force furnished by the field. In all direct-current machines the field is the stationary part while the armature revolves. In alternating-current machines, the field is the revolving part in all but the very small machines. 3. A device which collects or delivers current to the armature, depending on whether the machine is a generator or a motor. In the case of alternating-current generators and motors this is accomplished by brushes pressing on collector rings, if the armature is the revolving element. In larger alternating-current machines where the armature is the stationary part, the current is taken away from or delivered to the windings by leads entering the frame of the dynamo or motor. When dealing with direct current machines, current is delivered to or taken away from the armature by brushes pressing on a commutator whose function, as explained in the earlier part of this chapter, is also to change the alternating current into direct current. 4. A shaft passing through the revolving part, which is connected to the engine furnishing power in the case of the generator and to the machine to be driven in the case of the electric motor. 5. A frame, usually made of cast iron, whose function it is to support the bearings in which the shaft of the generator or motor revolves. 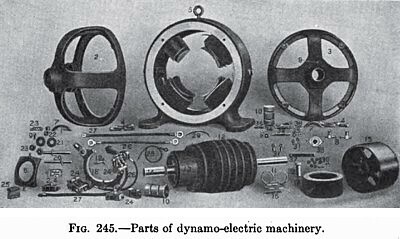 The various part of a D. C. Motor are illustrated in Fig 245. The first broad classification is into direct- and alternating-current motors. Direct-current motors are divided into three classes depending on the type of field winding as series-wound, shunt-wound, and compound-wound. For simplicity these three types are represented as bipolar machines in Figs. 248, 249, and 250. The series-wound motor has a winding similar to that of the series-wound generator. In fact, it is difficult to tell the difference between any direct-current motor and generator, the electrical features being the same. 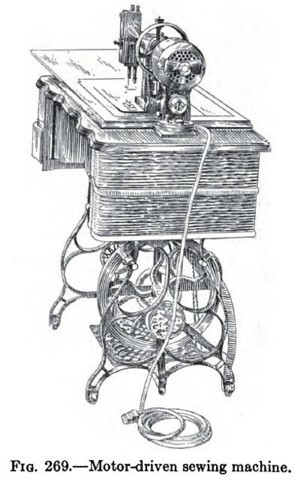 A series-wound generator when operated as a motor will run in reverse direction. The series-wound motor is used for work where hand control can be used as in the operation of hoists, cranes, and for the propulsion of electric cars. A series-wound motor can be started at full-load and should never be used where there is a possibility for the load to be removed suddenly. A series-wound motor will "run away"; that is, its speed will increase to such an extent that it may be destroyed by centrifugal force, if the load is removed. For this reason it is not safe to use belt drives with series-wound motors. A series motor is illustrated in Fig. 249. The principle of a shunt-wound generator is illustrated in Fig. 249. The field winding consists of a great number of turns of very fine wire. Both ends of the field winding are connected to the brushes of the generator. Since the field winding is very small in comparison with the line wire, only a small part of the current flows around the field coils. This type of generator is used for charging storage batteries. A shunt-wound generator will supply constant voltage provided the load does not vary much. The shunt-wound motor has the same type of winding as the shunt-wound generator. Shunt-wound motors are used for all kinds of work where fairly constant speed is desired. A well-designed shunt-wound motor will not vary much in speed with a variable load. In starting a shunt-wound motor it is necessary to put considerable resistance in series with the field of the motor. This is due to the fact that the resistance of the armature of a shunt-wound motor is very low. If a voltage of from 110 to 220 volts is allowed to pass through an armature of low resistance, an enormous current would flow through the armature in starting, which would result in injury to the armature coils, and also to the commutator by excessive sparking. By putting a resistance in series with the armature the current which is allowed to pass through it is decreased. Then, as the motor begins to speed up, the armature turning between poles of a magnet, produces a generator action which sends an electrical pressure in opposition to that which is sent in from the mains. This tends to reduce the current passing through the armature to a safe limit. In connection with this, it must be remembered, that weakening the field of a shunt-wound motor, reduces the above-mentioned generator action, and speeds up the motor. A break in the field connection of a shunt-wound motor, while it is in operation, may result in considerable damage by over-speeding. The compound-wound motor has a series and shunt winding like the compound-wound generator. It is used mainly for the driving of machines where very close speed regulation is essential, such as printing presses, machine tools, and looms. For most purposes, the shunt-wound motor is very satisfactory, and, being much cheaper than the compound-wound motor, it is used for the driving of all kinds of machinery which can be started at no-load. If motors are to be used for pumping, the series-wound or compound-wound motor should be selected, unless a clutch can be inserted between the motor and the pump. The method of connecting a shunt motor and its starting box to the circuit is illustrated in Fig. 266. A and B are the two leads which bring the current from the mains (connected to a generator) through the fuses P, R and to the switch S. One terminal of the switch L is connected to the field F and to the armature G of the motor. The other terminal K leads to the starting box. 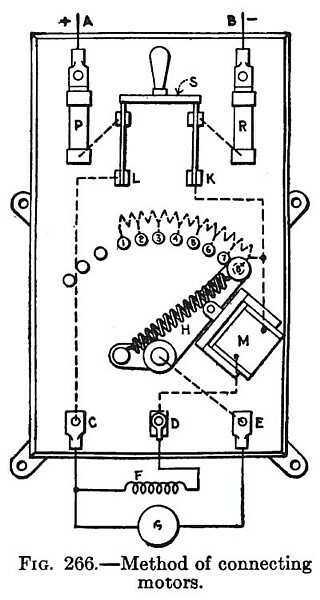 The handle H of the starting box is connected with the terminal E, which is attached to the armature of the motor. The other terminal D of the starting box is connected with the field of the motor F.
When the motor is to be started, the switch S is closed and the handle H is on the contact point 1. The handle H is then moved slowly to the right. When the handle H is on the last contact point, it is held in position by the magnet M. To stop the motor, the switch S is opened. The magnet M, losing its magnetism, allows a spring to bring back the arm H to the starting point. The electric motor is well suited for most farm work which is accomplished by the small stationary gasoline engine. It is not as portable in any but the very small sizes, but possesses other advantages for certain uses. A small electric motor requires no special foundation and may be placed on the floor, on a truck, or may be fastened to the wall or ceiling, is easily started and requires less care than the gasoline engine. The cleanliness of the electric motor and the absence of offensive fumes make it more desirable for use in the house, the dairy and the barn. Some of the uses of the electric motor in the home are illustrated in Figs. 267 to 269. The house pump driven by a motor of 1/6 hp. is shown in Fig. 267. 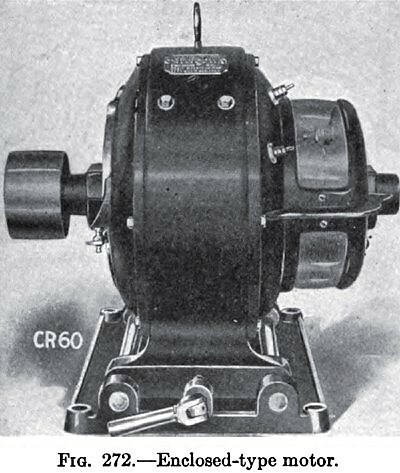 Another electric motor of 1/10 hp. drives a washing machine illustrated in Fig. 268. 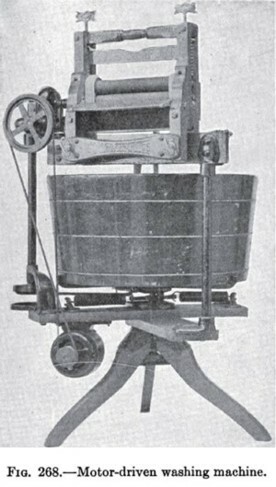 Still a smaller motor is shown connected to a sewing machine in Fig. 269. Other uses to which the electric motor can be put in the farm household may be mentioned: the driving of fans during hot weather, of vacuum cleaners, of ice-cream freezers, of cream separators, of churns, of milking machines and of grindstones. An electric motor can also be used for the shelling and grinding of feed and for the many operations in the farm shop. A dry, cool and clean place, free from dust, should be chosen for the location of an electric machine. If the surrounding air is warm, the temperature of the various parts is likely to rise to a sufficient degree to endanger armature, or field, or both. If a motor has to be located in a dusty place, or in connection with farming operations where particles of feed or trash may lodge on the motor, an enclosed type like the one shown in Fig. 272 should be selected. In locating motors or generators care should be taken to provide easy access to all parts. Also sufficient distance must be allowed between the pulley centers of the driver and driven. A substantial foundation of timber, brick, or concrete should be provided for all motors and dynamos above 25 hp. Small machines can be fastened to the floor and require no special foundation. If an electric machine has been exposed to changes of climate, it should be kept in a warm, dry place for several days, as the insulation always absorbs dampness which can be only slowly dried out. Small machines usually are shipped complete and ready to run. Large motors and generators usually are shipped in boxes, "knocked down," as this reduces freight charges. In assembling parts, all connections and parts should be wiped perfectly clean and free from grit. The bearing sleeves and oil rings should be placed in position on the shaft before the armature is lowered in place. The bearings should be filled with a good grade of thin lubricating oil, care being taken not to fill the oil cellars so they will overflow. In clamping the brushes in place, they should be adjusted so that the pressure on the commutator is about 1½ lb. 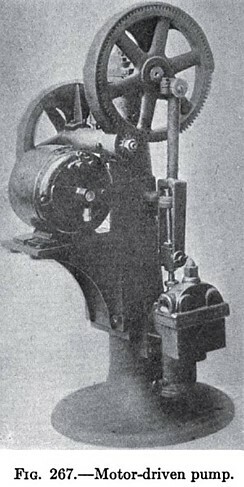 The brushes are fitted to the commutator by passing beneath them No. 0 sandpaper, the rough side against the brush and the smooth side held down closely against the surface of the commutator. The sandpaper should be moved in the direction of rotation of the armature, and on drawing it back for the next cut, the brush should be raised so as to free it from the sandpaper. It is then lowered and repeated until a perfect fit is obtained between the brush and commutator. Before starting a machine for the first time, care must be taken that all set screws and nuts are tight and that the oiling system works properly. The armature is then turned by hand to see that it is free and does not rub or bind at any point. The wiring should be carefully gone over and all terminals screwed down tightly. When everything is in good condition, the switch is closed, but before doing this one must make certain that the starting-box handle is in the "off" position. After the switch is closed, the handle on the rheostat is moved, gradually cutting out the resistance as the motor speeds up. It is well to run a new motor for a time before putting on the load. In stopping a motor, pull the switch and the handle of the starting rheostat should fly back to the "off" position. It is very important to keep electric machines clean and all insulation free from dust and gritty substances. The commutator should be kept clean and allowed to assume a glaze while running. Oil should not be used on commutators, as it chars under the brushes, forming a film between commutator bars which may cause a short-circuit. The commutator brushes should be kept in good shape. They should be removed frequently for inspection and cleaning, and if necessary should be filed. To remove grease or dirt the brushes should be soaked in gasoline. If the brushes are not properly trimmed or are in poor condition the commutator will present a bright coppery appearance and will be found rough when felt by hand. If in very poor condition, the commutator may have to be turned down. Sparking at commutators usually will occur if brushes are improperly set, commutator is rough, machine is overloaded, short-circuited or grounded. Heating of armatures may be caused by the short-circuiting of some of the armature coils or by too great a load. A short-circuited armature coil usually can be detected by its high temperature. If a greater part of the coils are short-circuited the determination becomes more difficult and sensitive instruments have to be used. A hot bearing also will cause the heating of the armature, and this usually can be detected and remedied.